On June 22 in East Timor, young people from Okinawa and East Timor performed examples of traditional performing arts and danced in a circle (taken by Katsuya Higa). In June, ten young people from Yomitan Village and Takashiho Junior Chamber were sent to East Timor on a youth exchange program run by the Japan International Cooperation Center (JICE). On July 16, nine of them shared their experiences and impressions of East Timor on the local radio station FM Yomitan. The program is part of the Japan-East Asia Network of Exchange for Students and Youths who aim to deepen mutual understanding among young people in East Asia. The visit to East Timor occurred from June 16 to 23, and included a performing arts exchange such as eisa, as well as a visit to Komoro Village which is famous for the production of traditional textiles. After years of conflict, the Democratic Republic of Timor-Leste, or more commonly known as East Timor, became an independent nation in 2002. It still has serious problems to deal with such as poverty and garbage issues but with support from international institutions such as the United Nations it strives to restore order in society and develop its economy. 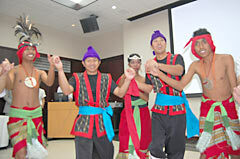 From July 20 to 25, 12 young adults from East Timor visited Okinawa on this exchange program.